All ready for day two of the Granger Bag sewalong? If you are making view A of the bag, today is going to be nice and easy for you. We will be using our magnetic snaps, so make sure you have these handy. You will also need pins, an iron, a measuring tape or guage, and your sewing machine. Lets get started! To follow along in your instruction booklet, today we will be covering steps 1 – 15. We are going to start with laying down our outer bag pieces to make sure we’ve got them straight. Flip the tops onto the bottom with right sides together and matching notches. Pin both outer bag top pieces to the outer bag bottom. Sew using a 5/8″ (1.5cm) seam allowance. Open your bag top pieces and press seam allowance toward the outer bag top. Top stitch on the outer bag top side, sewing together the bag top and the seam allowance at the same time. This creates a really strong seam for our bag. To install the flaps, mark two cut lines on either side of the ‘x’ on your fabric. Make sure the lines are the same distance apart as the snap prongs. Cut small slits in the fabric in order to slide the snap on. On the reverse side, slide on the metal back piece and press the prongs open. That is all for View A! Next, we will be making the bag flap for view B. 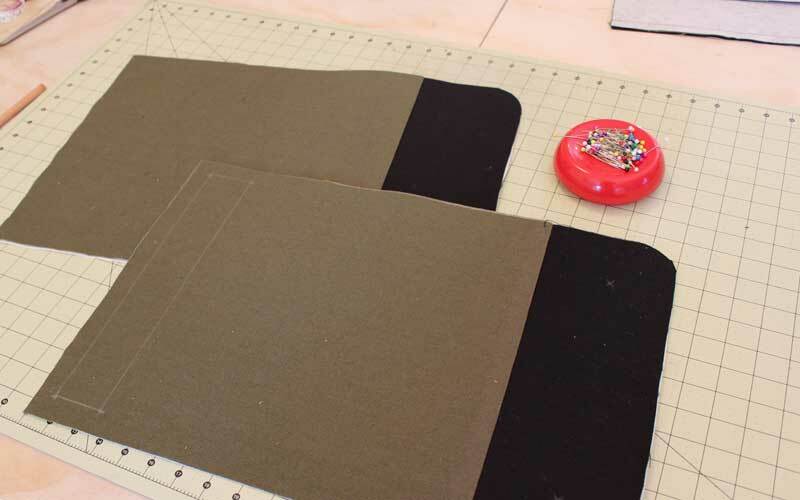 With right sides together and matching notches, sew bag flap bottoms to bag flap tops using a 5/8″ (1.5cm) seam allowance. Press the seam towards the flap top and topstitch, same as we did on the outer bag. For the snaps on view B, I like to put the lighter weight side of the snap on the flap, and the heavier side on the bag bottom. With rights sides facing, pin bag flaps together. Start pinning at the centre seam, to ensure that it matches up at that point. Sew along three sides using a 5/8″ (1.5cm) seam allowance, going slowly around those corners! Fold the bag flap opening down 5/8″ (1.5cm), pushing side seams open. Press. Lastly, we will be making the outer bag pocket for view B. Place the outer bag pocket lining inside the outer bag flap, wrong sides together. Fold in the corners, and then the edges twice. You will end up with a perfect mitered corner. Once folded, sew two lines of stitching along one of the long edges of the pocket. Center your pocket on the outer bag front (the side with the snaps), and place it 2 7/8″ up from the mid-seam. Sew pocket to bag using two lines of stitching. That’s all for the sewalong today! Check back on Monday for steps on sewing together the outer bag and adding the tabs. This sew along is a great supplement to the already excellent instruction booklet for someone like me who is a little light on their background and understanding in sewing – thanks! It’s saved me from a couple of snafus already. I will admit that I haven’t had any luck with the mitred corner pocket on my Bs though (the thick fabric pulls the double folds open no matter how I press it which makes the whole thing waver, and one corner always has overlapping for me – but let’s be honest, I’m frustratingly inexpert at pressing, which is crucial at this step) so I’ve removed them. Pockets are my jam though, so I’m definitely going to try again with your instructions elsewhere!